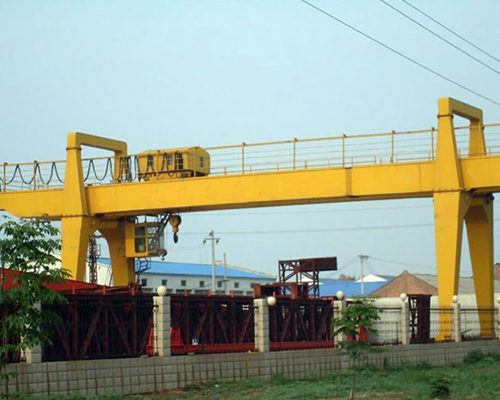 The electric gantry crane is widely used in outside warehouse or railway sideway to transport, move or lift goods. Usually, an electric gantry crane mainly consists of five parts, which are bridge, support legs, trolley, electric equipment, and hoisting mechanism. Featured with compact structure, light dead weight, the electric gantry crane is designed with advanced technology and various modes. Besides these basic kinds of electric gantry crane, we are also quite confident to custom your particular motorized electric cantilever gantry crane to fulfill all your requirements. 1.Strict and high profile manufactured standard. Adapted the advanced technology of European, our electric gantry crane are strict control in every production line. All our electric gantry crane and components are produced on the basis of DIN and FEM. A series of test service will be offer before our customer buying. 2.Lightweight design. Our motorized gantry crane is the result of over one century’s hard working and consistent innovation. Compared with the traditional technology, the electric gantry crane is lower with a decrease of around 25% and less with almost 30%, as well as owns lighter wheel pressure and quite small critical distance. 3.Modular design. There are much advantages can be get though a modular design. Such as the richer product assortment, easier installation and transportation, as well as the stable product quality and shorter supply cycle. 4.High security. Equipped with so many safety devices, our electric gantry crane with remote control holds the most safety. These advanced safety protection includes the monitor system of overload limiter, the self-examine system, limit switch, and imported wire rope from Germany. How to choose your most suitable gantry crane? The heavy duty gantry crane you choose has to meet the related regulations for gantry crane in the GB/T14406 and the GB5905-86. In general, most people will select the gantry crane with a lifting capacity less than 50 ton and span within 35 meter. If there isn’t some special use, the single girder gantry crane may be the best choice. However, if the gantry crane is used to lift heavy or big goods with fast speed, you’d better choose the double girder gantry crane. The span to a gantry crane is just like the blood to our body, which mainly decide to if it’s good or not. When choose a gantry crane, you should select the span as small as possible under the same condition. Second, you should make sure materials lifted can pass the support legs smoothly. Third, there exists a certain proportion between wheel track and span, it should be fit this formula that B= (1/4-1/6) S.
In order to benefit for loading, a certain pitch size should be spared between gantry crane outside size and aisle of transportation. Commonly, the distance has to reach 0.7m at least when a car is loaded in the span, while the distance will be 0.5m when the hanger isn’t work. Founded in 1955, Ellsen Machinery Equipment co.,Ltd company has been the biggest manufacturer and the largest supplier in China. With the development of more than one century, Ellsen Company now owns 6 factories, and employees more than 3000 workers, which includes almost 800 professional engineers and 1200 skilled workers. Relied on advanced technology and responsible attitude, our gantry cranes has been exported into more than 40 countries and regions including Asia, America, England, Middle east and so on, at the same time, our company has won great reputation among our customers.